Easy. Group size - 4 to 8. Five miles off Cape Cod's southern shore, this island has long been a favorite destination for exploration and recreation. Famous for its beauty and diverse geographical landscape, visitors to The Vineyard quickly become enchanted by "the land beyond the sea beyond the land". Its maritime climate creates a long warm autumn that we like to take advantage of, and that can even include a pleasant ocean swim or two! 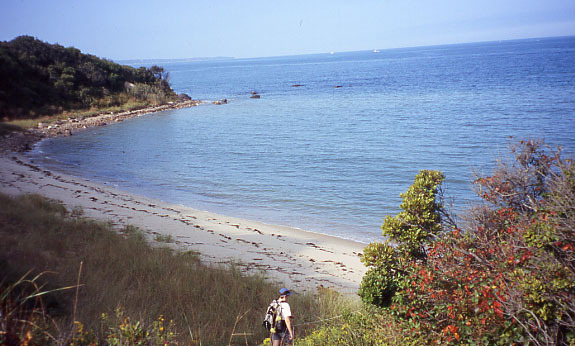 Scenic beaches, the traditional cedar-shake saltbox-type houses, and a variety of land preserves are among the many attractions for walkers here. Since we plan this outing after the busy summer season is over, we can also enjoy interesting town walks in historic Vineyard Haven, Oak Bluffs, and Edgartown without the hustle-bustle of tourist season. Perhaps the most surprising feature is the hilly middle section - the terminal moraine ridges and hillocks left by the glaciers which formed the island. A favorite walk that highlights this is the one to Wascosims Rock, a giant "glacial erratic" deposited on the moraine, and the superb view from the nearby "summit". Another surprise is the beautiful, diverse woodlands found in several locales from dwarf, wind-sculpted oak-and-beech forest to the open, aromatic pine forests. 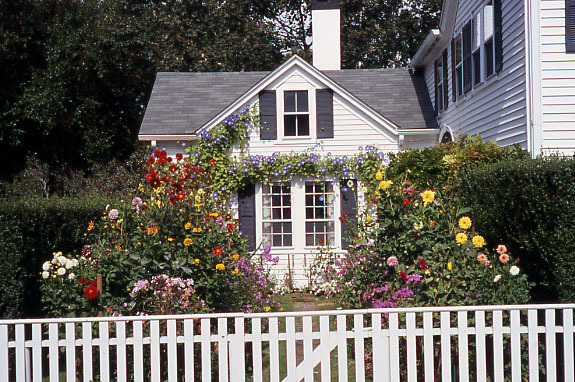 Other interesting activities include seeing the "gingerbread" cottages in Oak Bluffs, the Chicama Vineyards, which are the first plantings of European wine grapes in the state since colonial days, and the beach stroll below the mile-long clay cliffs of Gay Head in Aquinnah on the west side of the island. We stay at a secluded, mid-island lodging that is comfortable and oh-so-peaceful. No activity is longer than a 1/2 hour drive away. Dinners are at some of the finest island restaurants.